...that the Spider has connections all across the Solar System, even in Dead Orbit? ...that the Iron Lords were founded by Radegast, Jolder, Perun, and Saladin to bring an end to the reign of the Warlords during the Dark Age? "House of Kings. Name comes from the old world, from before the Whirlwind. Most Houses carry their name for pride. Kings carry their name because ... is what they are." The House of Kings is one of the major Fallen house, distinguishable by their yellow cloaks. They plot and plan in secret, their power only matched by their cleverness. Among the Eliksni they are unique, secretive, and dangerous. They hide in the shadows. Waiting. "The Kings understood Judgment, for together they ended the Edge Wars in their people's golden age." The Eliksni were once graced by the Traveler, which they named the "Great Machine", and were presumably uplifted by its gifts in the same manner as humanity. During this time, they came to control multiple star systems until a event known as the Edge Wars brought infighting among the Houses and was later ended by the House of Kings and the House of Judgement to usher in a Golden Age. Prior to arriving in the Solar System, the House of Kings was one of many Fallen Houses struggling to survive in the wake of a cataclysmic event known as the Whirlwind. In the aftermath of the fall, the Kings were said to have warred with the House of Wolves. Years later, they would arrive in the Sol system, setting down on Earth alongside the the House of Devils, although there are rumors they may have been to Mars as well. Despite being on Earth, the King stay in the shadows, and they are rarely seen if at all. "The House of Wolves and the Awoken tore the Reef apart trying to get a tactical advantage. All the while, we were desperately trying to hold the Walls against the Devils, Kings, and Winter. It was one of the darkest chapters in the City’s history." Craask, Kell of Kings, manipulating the other Houses, pushed for a united effort against The City. The Kings alongside the House of Devils and House of Winter stood together against The City, with the House of Wolves being the only major House unable to join because of The Reef stopping them on route on Ceres. The three united Houses fought against The City and its Guardians in what would later be known as the Battle of Twilight Gap. The City managed to push back the Fallen forces, with Lord Shaxx leading a counter attack and Saint-14 killing Solkis, Devil Kell to end the war. The power vacuum later allowed Craask, Kell of Kings to maintain some influence among the techno-worshiping leadership of the Devils and return to the shadows, choosing to bide their time and plan. "I spent a long time in the wilderness outside the Walls. I've mentioned it before. Red-marked House of Devils Fallen always tracking my movements. The entire time I was out there, I think I saw one member of the House of Kings. Just sitting on a wall, scanning the horizon. Never even gave me a second glance." The Kings held very little territory in the Cosmodrome, holding only the Terrestrial Complex and King's Watch. They were encountered by Guardians seeking out a mysterious signal in the area, and again later when they returned to try and restore an Array in the Terrestrial Complex. Later, the Hive general Omnigul would lead a fireteam of Guardians through Kings Territory in an attempt to stop them from hunting her. Phyksin, King Baron personally attempted to stop the Guardians, but was killed in the resulting battle. "Skolas goes after Winter. Devils, Kings. Seeks power. Kings deny him. Kell of Kings hides well. Perhaps he will take back the Great Machine. Perhaps I chose the wrong side. It is not too late"
During the Wolf Rebellion of Skolas, Kell of Kells the House of Wolves approached the Kings with an offer to join them. The Kell of Kings sent two of his Barons, Paskin and Vekis, to meet with the Wolves. 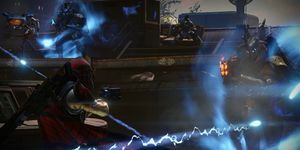 Prince Uldren of The Reef suspected that the Baron's true mission was not to parley with the Wolves, but rather assassinate their representative Yavek, Wolf Baron. The truth of the plot would never be discovered, as a Guardian guided by Variks, the Loyal intrupted the meeting and killed all three Barons in the resulting skirmish. "Taken will not rest. Will claim every house. Consume every banner." During the The Taken War, the King's presence in the Cosmodrome diminished as the King's Watch was no longer in their control when it became a lair for a Shade of Oryx on Earth.. The Kings took significant losses to Oryx, the Taken King, leading them to hide in the shadows even more. "Look at it from the House of Kings' perspective. Their power is matched only by their cleverness. They rule the Devils from the shadows and came too close to toppling the City not once, but twice. We don't know much about them, but we know this: the Kings want the Traveler." For many years the House of Kings maintained influence over the techno-religious leadership of the House of Devils and controlled the Archon's Forge until a younger, more ambitious sect, the Devil Splicers assumed control over the Forge. 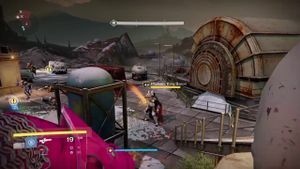 This gave rise to three new Devil Archons and allowed the Splicers to burrow into connecting area of Site-6 to infuse themselves with SIVA. 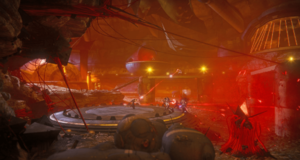 By the end of the SIVA crisis, the House of Kings seemed to have pulled out of the Cosmodrome completely. Later Uldren Sov allowed himself to be captured by the Kings to meet their Kell, seeking to try and manipulate them into serving him. However Uldren ended up allying with the Kings and being sub-ordinate to their Kell, Craask. Around the same time, reports of the Fallen as a whole pulling out of the Cosmodrome completely began coming in. "Thou shalt tell the Eliksni to tear off their banners. Thou shalt tell them that we must all surrender to each other. We must give up our rivalries, or we will not survive." One year after the SIVA Crisis, the Kings, as well as the other Houses, seem to have vanished entirely, and a never-before seen House of Dusk has taken their place. However, further inspection shows that many members of the House of Dusk come from the other houses, including the House of Kings. All House of Dusk communication protocols are variations of the House of Kings. This is because Craask, Kell of Kings gave orders to Uldren to unite the Fallen as Craask's remaining pride could not tolerate the disgrace of giving the word himself. "Honorless, at the end.... Faithless and false. Your sister's will kept us from the Great Machine, Uldren Sov. She challenged the Wolves by right of noble lineage. But you… you skulk in shadows and filth." The alliance between Uldren and the Kings leads him to become a traitor as he works alongside them to kill his own people, steal from them, and bring more destruction to his home. At one point he meets a dying Fikrul and manages to save the Archon by causing Fikrul's Ether to become corrupted with darkness. As time goes on, Uldren finds a kindred spirit in Fikrul, and they bond through their shared dislike for their peoples' fates, and desired to see evolution through extinction. While the Kell of Kings wished to go backward by relying more on Servitors and machines. With the aid of Fikrul, Uldren takes over the House of Kings. The Last Kell, Craask; and one of the last surviving Fallen before the Whirlwind, is docked and demoted to Dreg status in a grand betrayal as Uldren decides that the Kings are too bothersome for his ambitions and gutted the House. The deceased Kings were then raised by Fikrul as a new undead army willing to serve them called the Scorn. Remnants of the House of Kings now resides near the Shard of the Traveler in the European Dead Zone. "Why do you think the Houses are named the way they are? House Winter. Maybe it's geographic? House Kings, some kind of global ruling sect? Strange to think about how these terms have survived, their context completely removed." The Kings are the only Fallen House that over their attendance in the Sol System has not undergone a loss in leadership. The Devils have lost two Kells, their Prime, and several Archons, Winter; their Kell and possibly their Prime, and the Wolves; two Kells, two Primes, and several Archons. This makes them currently the strongest known Fallen House in the system after the House of Dusk. However, following Uldren's betrayal, Craask's death and the Scorn's rise to power, the House of Kings is left horribly weakened and borderline broken. Without their Kell and the Scorn raising their dead as new members, the once powerful House of Kings is forced to hide for survival. According to the Killcam, the Archon Servant belong to the House of Kings. 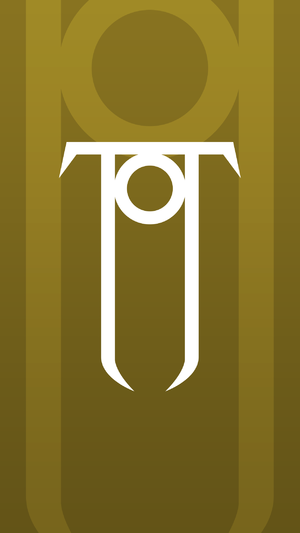 The Archon's Forge has banners belonging to the House of Kings. It is possible this ancient rite of passage belonged to the Kings until it was twisted to utilize the Devil Splicers use of SIVA. This may explain how the Devil Splicers were able to champion three Archons. The Hollowed Lair, Kell's Grave and Kingship Dock were previous strongholds for the Kings decorated with yellow banners.